Our Microwave Popcorn Popper is the tasty, economical, and healthy alternative to those greasy and expensive microwavable popcorn bags. 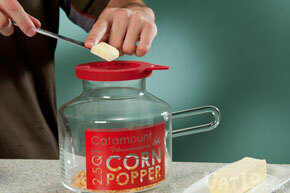 With Catamount's Microwave Popcorn Popper, making healthy and delicious popcorn is simple. Pour your kernels of choice into the 2.5 quart container, place your desired amount of butter in the silicone melting lid, and microwave for 2 minutes and 45 seconds. As the butter melts, it will drip through the lid and evenly coat the kernels as they pop. 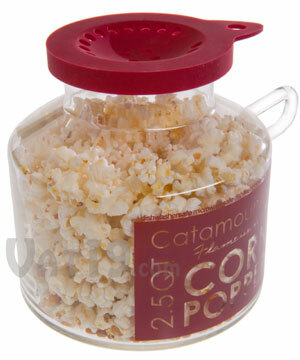 The Microwave Popcorn Popper is made from borosilicate (laboratory glass) and is dishwasher safe. The large glass handle becomes warm, but not hot, for easy transfer to bowls. 1:10 - When this video was made, the Popcorn Popper was fully made in the USA. Currently, it is assembled in the USA with some parts originating outside of the US. Healthy: You control how much or how little butter is added to your popcorn. Delicious: Popcorn tastes great. But, when you control the ingredients, it's going to be perfection. Economical: Popping your own kernels in the Microwave Popcorn Popper costs about four times less than those microwaveable bags. The Microwave Popcorn Popper makes popping your own popcorn as easy and simple as those microwave popcorn bags without the high cost and potential for an immediate coronary. 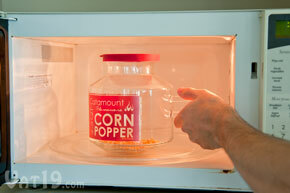 Pop your own popcorn quickly, easily, and on-the-cheap with the Microwave Popcorn Popper. 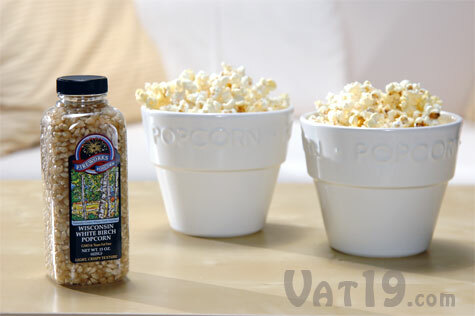 Until now, popping your own popcorn was never a quick and easy process. 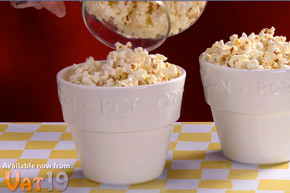 With the Microwave Popcorn Popper, simply pour a single layer of kernels into the glass popper, add butter to the melting lid, and toss it in the microwave. In less than three minutes, you've got a delicious bowl of popcorn! 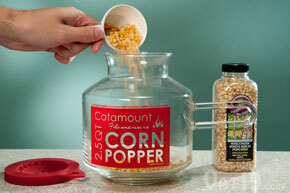 Step 1: Pour a half cup of your favorite kernels into the popcorn popper. Step 2: Add desired amount of butter to the melting lid. Step 3: Place in the microwave for approximately two-and-a-half minutes. The butter in the melting lid will slowly drip onto your popcorn as it pops. Step 4: Enjoy your delicious snack! 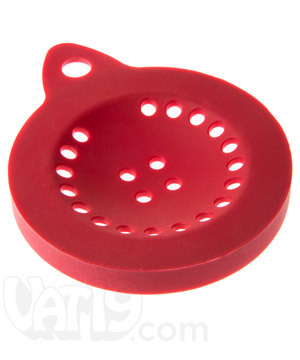 When movie night is over and you're done steaming over paying $4 to download The Worst Movie Ever (aka Confessions of a Shopaholic), just toss the melting lid and popcorn popper into the dishwasher. Hey, even if the movie was disappointing, at least the snacks were delicious. Clean-up is easy. 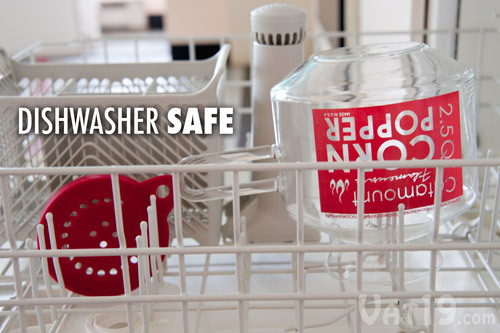 Just toss the popcorn popper and melting lid into the dishwasher. 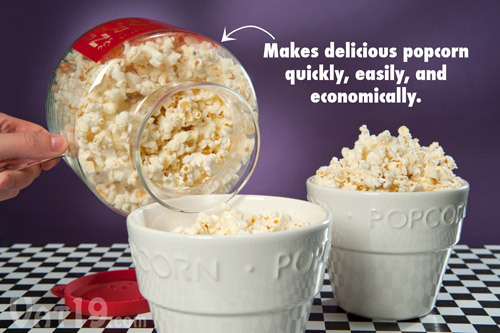 Bundle your purchase of the Microwave Popcorn Popper with a 15 ounce container of Wisconsin White Birch Popcorn kernels and you'll be ready to snack right out of the box! We chose this brand and style because it is amazingly delicious, all-natural (GMO-free), and features tender hulls that shatter easily when popped. The small, family-owned business employs local farmers who do not genetically alter or cross-grow their corn with larger, less expensive "field" corn. 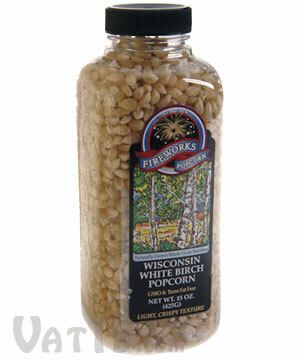 Enjoy delicious Wisconsin White Birch Popcorn from your Microwave Popcorn Popper.